In the Pinks is an easy baby quilt with lots of visual texture running across its surface. The quilt is made from two traditional quilt blocks, Broken Dishes and a variation of the Hour Glass (somewhat different from my other Hour Glass Pattern). The quilt blocks are set on point and surrounded by setting triangles and corner triangles. One fabric is repeated in both blocks to tie them together, but other block fabrics are unique. A narrow border separates the block top from the outer border. Not into pinks? You can change this baby quilt dramatically by choosing different fabrics. See page 7 for a completely different look. Block Finished Size: 9" x 9"
Quilt Finished Size: Approximately 44" x 57"
Fabric should have a minimum usable width of 42". A little extra yardage is always a good idea. Mottled pink print; includes a small amount of fabric used for small pink squares in Hour Glass quilt block. Light pink print; includes print used in half square triangles in Broken Dishes block. Medium lavender plaid-like print; includes fabric used in half square triangles in Broken Dishes block and small squares in Hour Glass block. Assumes you will sew on a traditional binding. Each should measure about 48" x 61"
About 210 running inches made from long strips of fabric. For best durability, use doublefold binding. The Broken Dishes quilt block is made up of four half square triangle units. These instructions use the sandwich method, but there are other ways to construct them. Change cutting instructions as needed if you use another method. You'll make twelve Broken Dishes quilt blocks, each with a finished size of 9" square. Refer to the illustration on page 5 for a close-up of fabrics. Combine a pink/yellow "plaid" square with a light pink floral/butterfly print square. Use the quick pieced half square triangle method to create two half square triangle units from the pair. Each completed unit should measure 5" x 5". Chain piece to speed things along. Repeat, combining all remaining pairs of the same two fabrics to make a total of twenty-four identical half-square triangle units. Combine each medium lavender "plaid-like" square with a pink geometric print square to create a total of twenty-four identical half-square triangle units. Each should measure 5" x 5". Sew the units together in two rows, each row containing two different half square triangle units. Be sure to position squares so that triangles are oriented as shown in the illustration. Sew the units in each row together as shown here and on page 5. Press seam allowance towards the darker fabric. Sew rows together, butting center seam for a snug fit. The quilt block should measure 9-1/2" x 9-1/2". Make a total of twelve identical quilt blocks. The Hour Glass quilt block is made up of two identical four-patch units and two identical half-square triangle units. You'll make six Hour Glass quilt blocks. Refer to the illustration on page 6 for a close-up of fabrics. Pair a yellow/pink square with a medium lavender square. 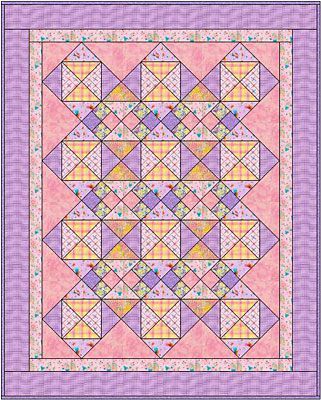 Use the quick piecing method again to create two half square triangles from the pair. Each completed unit should measure 5" x 5". Repeat to make a total of twelve identical half-square triangle units. Cut one 2-3/4" x 35" strip from each of the following fabrics. Cut two 2-3/4" x 35" strips from the following fabric. Sew a lavender "plaid" strip lengthwise to a lavender/yellow floral strip. Press the seam allowance towards the lavender/yellow strip. Square up one end of the strip set and then cut twelve 2-3/4" segments from it. Sew a mottled pink strip lengthwise to a lavender/yellow floral strip. Press the seam allowance towards the lavender/yellow strip. Combine two unlike 2-3/4" segments to make a four-patch unit, placing the lavender/yellow florals diagonally from each other. Press seam allowance either direction. Repeat to make a total of twelve four-patch units. Create two rows for each block, positioning units as shown in the illustration. Press seam allowances towards the half square triangle units. Sew block halves together. Make six blocks. Each should measure 9-1/2" x 9-1/2". In the Pinks is an on point quilt, and that means we'll sew components in diagonal rows. Beginning quilters: learn why we use two types of cutting methods for corner and setting triangles. Cut two 7-1/4" x 7-1/4" squares from mottled pink fabric. Cut each square in half once diagonally to make corner triangles. Cut three 14" x 14" squares from mottled pink fabric. Cut each square in half twice diagonally to make setting triangles. Use a design wall to arrange blocks, or improvise by tacking a piece of batting or neutral flannel onto a wall. A vertical view of the quilt will help you arrange components and the blocks should stick to the wall without pins, making it easy to shift them around. Use the illustration on this page and on page 1 to arrange your quilt blocks, placing them on point and in diagonal rows as shown. Place large setting triangles at the ends of each row, but don't worry about the corner triangles yet. Step back and look at the quilt. Do you like the layout? If not, rearrange the blocks and check again. You might decide to orient your blocks differently than mine -- make the four patch units point up instead of down or flip-flop the Broken Dishes blocks. When you're satisfied with the layout, sew components of each row together. Sew rows to each other, pressing seam allowances between blocks in opposite directions where possible for a snug fit. Sew a corner triangle to each corner of the quilt. Press the quilt. See my instructions for straight borders before you begin. Make inner borders from 2-1/2" wide strips of the light pink print. Add outer borders using 4-1/2" wide strips of the lavender print. Sandwich with batting and backing and baste layers together. Quilt the quilt. Trim excess batting and backing, squaring up edges (and corners) very carefully if necessary. Make doublefold binding strips and bind the quilt. A close-up image of the Broken Dishes quilt blocks used to assemble this baby quilt. A better look at the Hour Glass quilt blocks used to assemble the baby quilt. This quilt, in Civil War style prints, looks very different than its pastel counterpart. It's easy to change In the Pinks to suit an entirely different theme.